On the night of the lunar eclipse of Sept 27, 2015, I took this ~80 second long exposure of Spring Point Ledge Light. 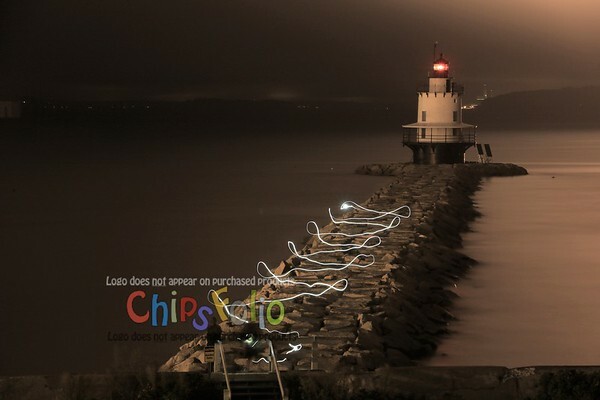 During that time, some person came zig-zagging back along the breakwater and the graceful loops you see here are the light-trail produced by a flashlight he/she was pointing back at the friends in the lower corner. How this person didn't fall into the wide spaces between the breakwater's giant blocks is a mystery to me; it was quite dark as we were in the middle of the lunar eclipse. These folks disappeared into the night along the shore, and I didn't get to share the photo with them. The photo is taken from the "high ground" of Fort Preble which is on the north end of the Southern Maine Community Campus, in South Portland, ME.